Where will Morrison end up? Let us know! 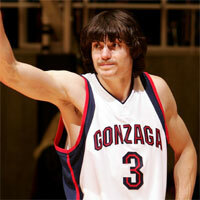 Diagnosed with Type 1 Diabetes in junior high, Adam Morrison has never let the disease stop him as he was widely considered the most exciting college player in the land in 2006. The 6-foot-8 forward racked up 28.1 points a game on 49.6% shooting as a junior at Gonzaga, and with his shaggy hairdoo and thin moustache he became as recognizable to hoops fans as any NBA superstar. A sharp shooter and explosive scorer, Morrison tallied 40 or more points in 5 games in 2005-06, including 44 against Loyola Maramount in a game where he shot 14-20 from the floor and 8-13 from long range. On the offensive end of the ball, Morrison has virtually all you could ask for. He is an outstanding scorer, but more importantly has an incredible ability to hit the "tough shot", which draws many comparisons to Celtic great Larry Bird. He has a great passion and feel for the game, and improved each year at Gonzaga -- particularly from long range, where he hit almost 43% as a junior. He is a solid passer and moves well without the ball. Defense, defense, defense. While Morrison excels as a scorer, his defense does nothing to stick out and will have to improve a great deal in the NBA. Same goes for rebounding -- he will need to improve his strength and quickness. Though Morrison manages his diabetes extremely well, NBA executives will no doubt wonder how an 82-game schedule and playoffs will impact him. Adam Morrison on the Houston Rockets? The 2005-06 season exposed the Houston Rockets as Yao Ming, Tracy McGrady and the Brick Brigade, so make no mistake, this team could certainly use a scorer like Morrison. If his scoring prowess translates well to the pros, he could have the type of impact over time on the Rockets that a guy like Manu Ginobili does on the Spurs. He thrives in the half-court game, where playing with a Yao Ming would make him ideal. Nonetheless, barring underwhelming workouts, Morrison will almost assuredly go in the top 4 selections.